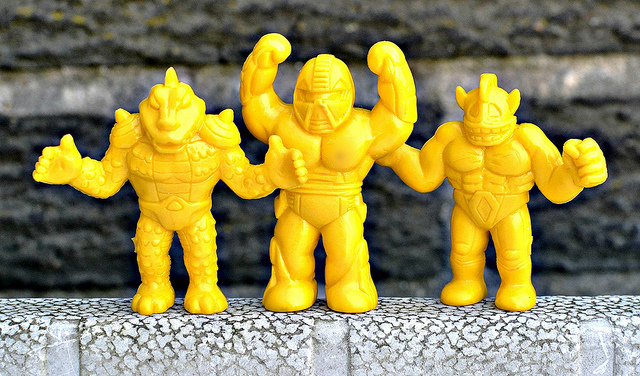 When most collectors think of weird little wrestling mini figures from the '80s, they think of MUSCLE. 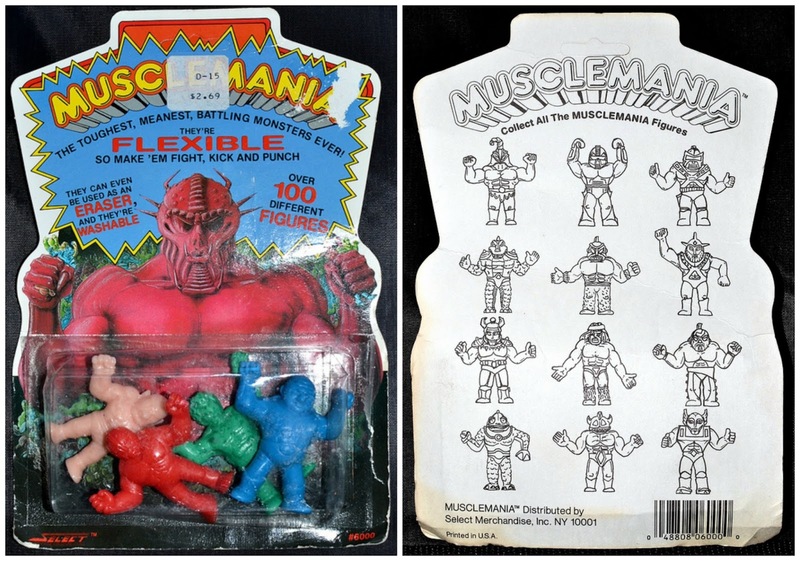 But there's actually a similarly-themed toy line with a copyright year that predates the release of MUSCLE in the U.S. This set is called Musclemania, a rather obscure release that first came out in 1984 from a company called Select Merchandise, Inc. I've briefly posted about Musclemania in the past, but I've since completed my set, so figured it was time for a more detailed post. MATERIAL: The figures were released in multiple kinds of plastic/rubber. What I believe are the initial 12 sculpts (pictured at the top of this post), are most commonly found in a firm-yet-flexible soft plastic. 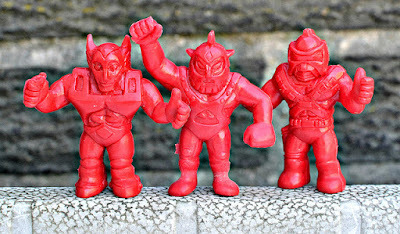 I believe all or at least some of these sculpts, in addition to 12 other sculpts (pictured lower in this post), were also released in a super soft, stretchy rubber. To make things even more complicated, I have also seen figures in a harder plastic. TIMELINE: The timeline around when these different kinds of figures released is muddy. I believe that the initial 12 soft plastic figures came out in 1984, and that the stretchy versions--including the 12 new sculpts--were released around 1986. PACKAGING: Musclemania figures seem to have been sold in both 12-packs and 4-packs. Based on what I've seen online over the years, I believe 4-packs and 12-packs were released in 1986 and contained the 12 "new" sculpts plus the previous 12 sculpts in stretchy rubber. I remember getting some of the 4-packs as a kid at Toys R Us in the late '80s. In my research, I still have not found out how the earlier, 1984 soft plastic figures were released. To my knowledge there hasn't been a packaging photo for the earlier figures found online. SCULPTS: Some of the figures look like they were sculpted to originally hold weapons, suggesting the theme might not have originally been wrestlers. Perhaps they were meant to be fantasy/space-themed toys, and then Select changed course to make them wrestlers to get in on a growing interest in wrestling among kids? COLORS: The firmer figures seem to have been released in red, light blue, yellow, green, and translucent green. I'm not sure exactly how the trans green factored into assortments, but figures in that color seem to be more uncommon than the others. 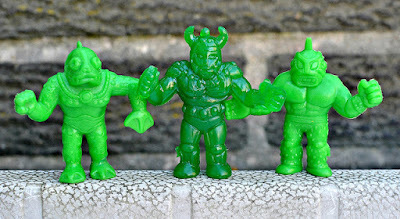 The stretchy figures came in light flesh, green, blue, and red. So all these years later there are still many unanswered questions with Musclemania. It's a bit of a mystery, which probably adds to its appeal. Here's a closer look at what I consider to be the 12 initial sculpts. My favorites are the stranger, more monstrous guys, like the fish dude and gator/lizard-like dude. Note that two of the green figures are standard green and one is the translucent green. And shown below are four of the 12 additional sculpts, in the stretchy rubber. These later sculpts have a distinct difference in design from the first 12. They were clearly designed to be more normal-looking wrestlers, eliminating the monster/space-like attributes that some of the first 12 figures have. This further supports the theory that the 12 first figures were originally planned to have a different theme, and that the 12 additional sculpts came later, after the wrestling theme had already been established and sold via the initial figures. 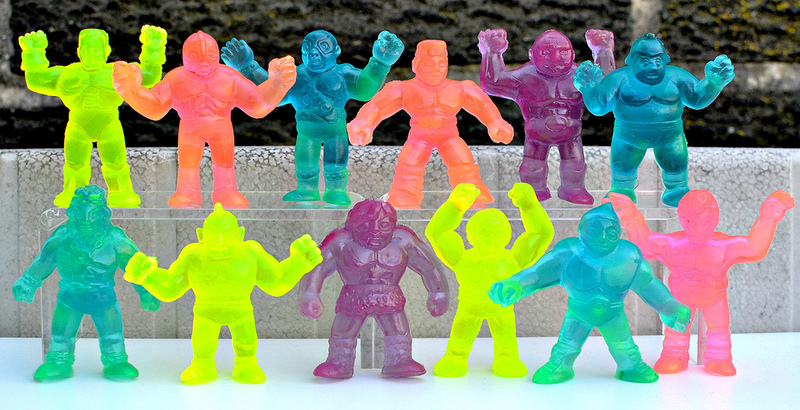 A curiosity that popped up recently is a set of Korean Musclemania figures in bright, transparent colors. These are assumed to be bootlegs, but I don't think much is known about them aside from the fact that the seller who discovered them bought them in large bunches in a plain plastic bags. The clear colors are yellow, pink, purple, and blue, and green (green is not pictured here). Only the 12 later sculpts are included, but the material is very close to that of the 1984 figures--soft plastic, not squishy rubber. I am glad to have these 12 sculpts in this firmer material, because the official, stretchy versions can melt/degrade with time. And there we have it. There's quite a bit to talk about with Musclemania, considering its such an obscure line. For more coverage and photos, be sure to check out the great articles on University of MUSCLE and MinifiguresXD. What do you think of these guys? Do you remember seeing them back in the day, or do you collect them now? Do you know anything more about them than what I covered here? Very cool stuff! I'm especially intrigued at how this might have fit into the progression of the "weird wrestling" genre of toys and other media. 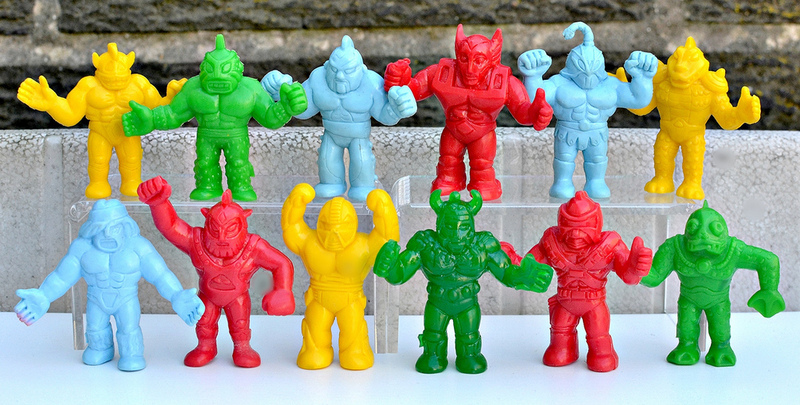 Since these seem to have come before MUSCLE but after Kinnikuman was created, I wonder how closely some of these may resemble previously created characters. Yeah, it's really interesting. 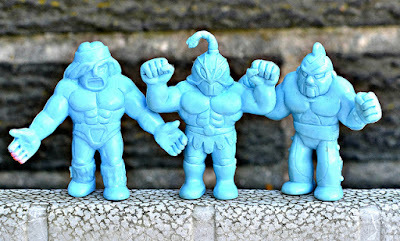 In the post at University of MUSCLE, it's speculated that Select might have been aware of Kinnikuman/kinkeshi from Japan and tried to be the first to market with a similar product in America via Musclemania. Who knows for sure, but it's an interesting theory.